Cauliflower is a versatile vegetable and when shredded and grated it has a neutral flavor making it an easy swap in “mock” rice, “mock” mashed potatoes and in recipes like this one for “mock” tater tots. Right out of the oven these little cauli-tots are crispy and delicious! Reheated they’re pretty good too. Cheesy cauliflower tater tots are crispy and delicious. This version of the tater tot is much healthier with swapping potato for cauliflower. Cauliflower has a mild delicate flavor like the potato and is easy to use when you’re looking to make lower carb/lower glycemic load foods. Enjoy! Shred the cauliflower either on a box grader, Cuisinart, or a Vitamix and pulse in 4 small batches to grade the cauliflower. Place the shredded cauliflower in a cotton tea towel and ring out as much of the moisture as you can. Combine the shredded cauliflower, cheese, egg, cornmeal and salt in a bowl and mix well. Use paper towel to wipe the inside of a mini muffin pan with coconut oil. 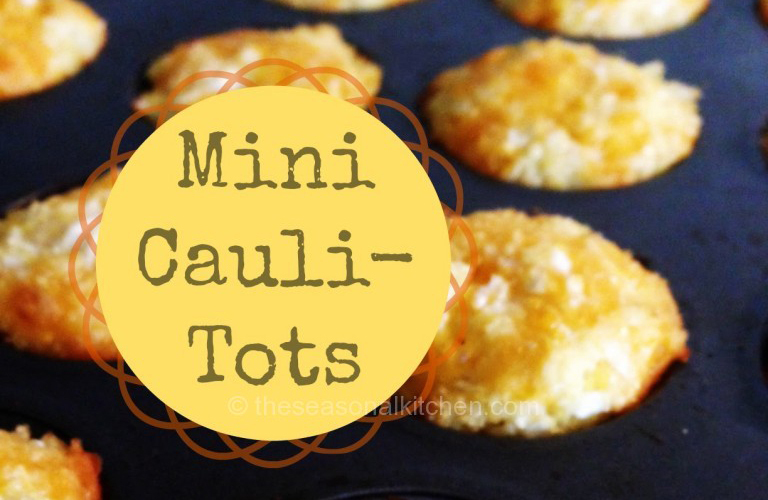 This will help the mini cauli-tots from sticking to the pan. Once oiled fill each muffin cup, pushing the mixture in well. Bake at 400 for 15-20 minutes until golden brown on the edges. Cool slightly before removing the cauli-tots from the mini muffin pan. Enjoy!